So the Eurozone banking system is still hanging by a thread, to judge from the level of swap spreads, but the outlook for the Eurozone's larger debtors has improved measurably—an apparent contradiction. 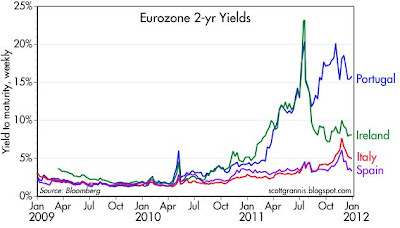 One plausible explanation for this is that the ECB's massive balance sheet expansion in the past week or two (see chart below, which is measured in trillions of dollars) has artificially depressed Italian and Spanish yields, but has not done anything to address the fundamental problem of the Eurozone, which is that too many governments have borrowed and spent more than they should have, and on unproductive activities. Thus, Spanish and Italian debt prices have improved, thanks to ECB purchases, but the whole Eurozone financial structure, as reflected in very elevated swap spreads, rests on very shaky bedrock. It makes sense that the ECB can't fix the Eurozone's problems simply by buying the bad debt of struggling PIIGS countries. The ECB can, however, buy time for the system to fix itself, and there are signs that the PIIGS countries are beginning to take needed action to reduce their spending. But in the meantime, what about the consequences of massive central bank balance sheet expansion? Doesn't that just compound the problem by introducing the risk of hyperinflation? Not necessarily. As with the Fed's balance sheet expansion, the vast majority of the bank reserves that have been "created" in the process of accumulating Treasury, MBS, and sovereign debt are still sitting idle on the central banks' balance sheet in the form of excess reserves. In essence, all that has happened is that the central banks have exchanged bank reserves for bonds—the rough equivalent of transforming risky bonds into risk-free bills. The market has been happy to unload trillions of dollars of bonds for bank reserves, and this means that a huge share of the burden of default risk of PIIGS debt has been shifted to the ECB. It has also satisfied the huge demand for safe-haven assets. But if the ECB's new assets end up defaulting or being written down significantly, this will erode the ECB's balance sheet and impair its ability to defend the value of the Euro. How would that work? Presumably, at some point the world will become less fearful of an economic and/or financial market collapse, and the demand for money will decline. A declining demand for money is equivalent to an increased desire to borrow money, and the existence of trillions of bank reserves gives banks a virtually unlimited ability to create new spendable money. Money supply expansion could become brisk and eventually undermine the value of the Euro; the ECB would ordinarily avoid that by withdrawing reserves from the banking system, and that would be achieved by selling off its accumulated balance sheets assets. Of course, if those assets have dwindled due to defaults, then the ECB couldn't fully reverse its reserve injections, and the Eurozone could end up with a huge surplus of money. 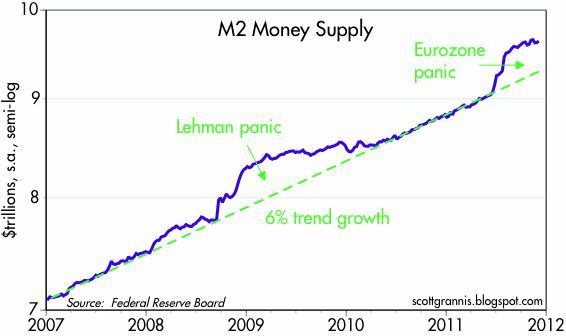 For the time being, there is no sign of any unusual expansion in the Eurozone money supply (the chart above uses the latest data available, as of 10/30/11). 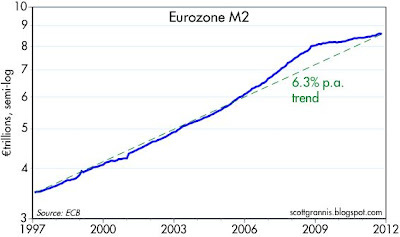 M2 in both the Eurozone and in the U.S. has been growing at slightly more than a 6% annualized rate for a long time. So although the situation is far from ideal, it is neither catastrophic nor beyond hope. This is a slow week with not much happening, so I'm just going to post some updated charts and brief commentary. The October Case Shiller home price index was a bit weaker than expected, and it has hit a new post-recession low. 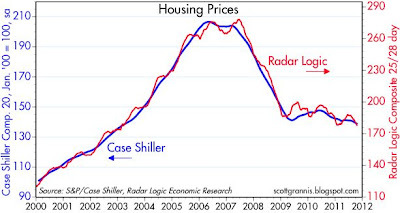 The Radar Logic home price index continues to track the Case Shiller index pretty tightly, and it confirms that housing prices on average are at a new post-recession low. 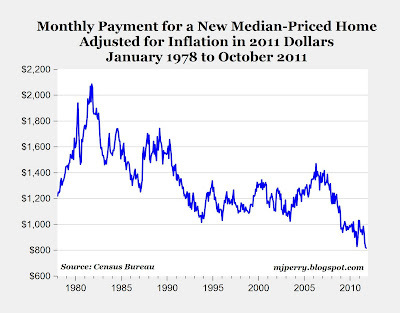 Prices have been drifting slowly lower since mid-2010. On a longer time scale, using prices only from the top 10 metropolitan areas and adjusting for inflation, the downward drift in prices in recent years is a bit more pronounced, but it's nothing at all like a free fall. 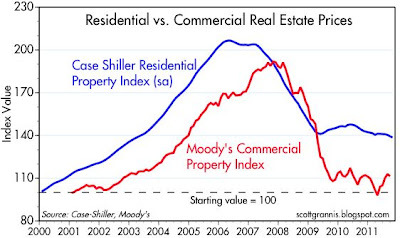 This chart compares the prices of residential properties to commercial real estate property values. 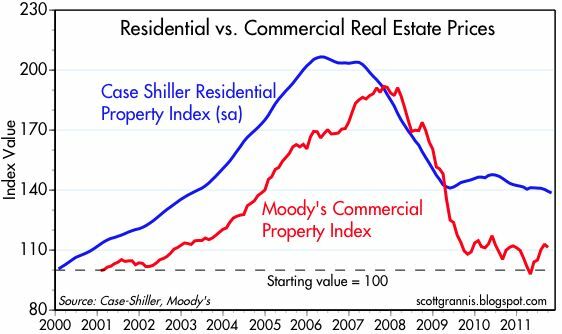 Commercial real estate has fallen by more than residential real estate from its highs (-42% vs. -33%) and faster, but perhaps because of its more significant correction, commercial real estate now shows more signs of having stabilized. 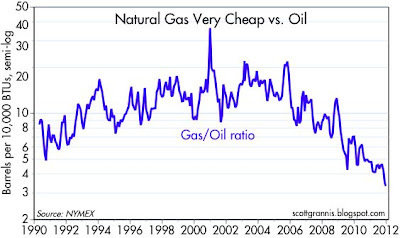 Prices are down significantly just about everywhere, and financing costs are at historical lows. The combination of the two makes for a gigantic effective price adjustment, and that's what it has taken to clear the property markets. Whether we need a significant further adjustment is the question on everyone's mind. 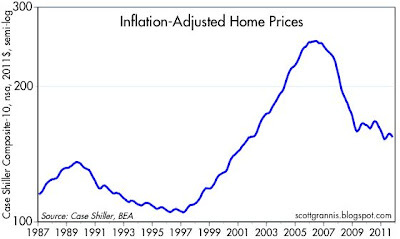 If the heavy lifting is over (i.e., no more major downward price adjustments), then now would be a good time to start getting back into the real estate market. The Bond Vigilantes blog caught my eye this morning, with an excellent post and chart which inspired this version above. What this chart shows is that (up until last summer, that is) bond yields have been strongly influenced by the market's understanding of how weak or strong the economy. 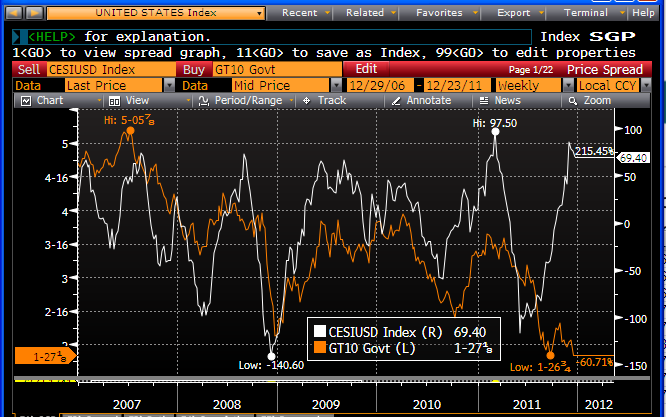 The white line is the Citi Economic Surprise Index, which tracks how actual economic news releases compare to expectations. The index has moved up strongly since last summer, as almost every economic indicator has come in stronger than expected (with the weekly claims report this morning the latest example). In the past, a stronger-than-expected economy such as we've seen in recent months would have led to a substantial rise in Treasury yields (10-yr yields are shown in orange). 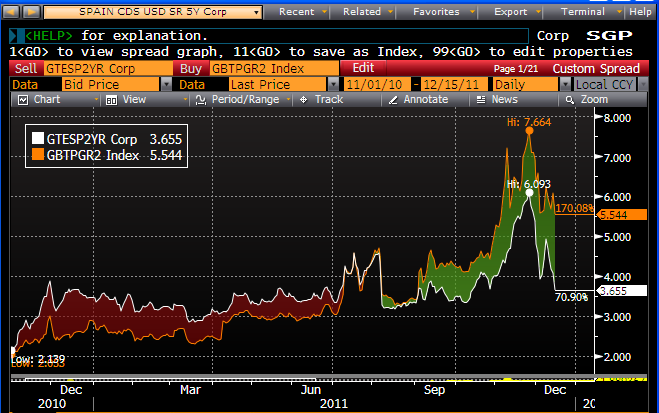 But not now, most likely because (and here I agree with the Bond Vigilantes) the market is terrified of PIIGS defaults. The news in the U.S. has clearly gotten better, but the news coming out of the Eurozone has been pretty awful, and Treasuries end up being the beneficiary of the world's intense demand for safe-haven assets. The Fed and others might argue that Operation Twist (the Fed's current program of selling short maturity bonds and buying longer maturity bonds) is responsible for holding down 10-yr yields, but I don't buy that. The Fed can control the level of short- and intermediate-term yields, but not long-term yields. Thought experiment: if the news in Europe suddenly took a turn for the better (e.g., PIIGS governments took genuine steps to curtail spending), wouldn't you expect 10-yr yields to rocket higher? The bond market is likely a tightly coiled spring, with yields compressed by fears of Eurozone defaults and a possible collapse of the Eurozone financial system. 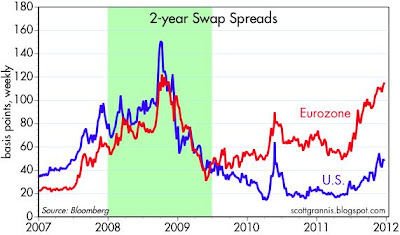 2-yr Eurozone swap spreads confirm this, as they are still trading at nosebleed levels of 115 bps. To push yields down further would require these fears to be realized by a succession of truly awful events (and that's where I disagree with the Bond Vigilantes). Third quarter GDP today was revised down by a few billion dollars, but that's old news. The more recent news provides more evidence that fourth quarter growth will be stronger, and the U.S. economy continues to beat the market's rather dismal expectations. 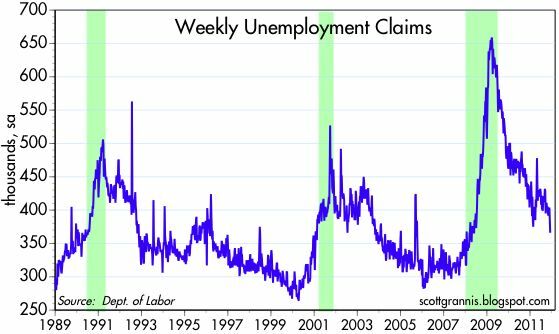 Seasonally adjusted unemployment claims once again surprised the market by coming in lower than expected (364K vs. 380K). 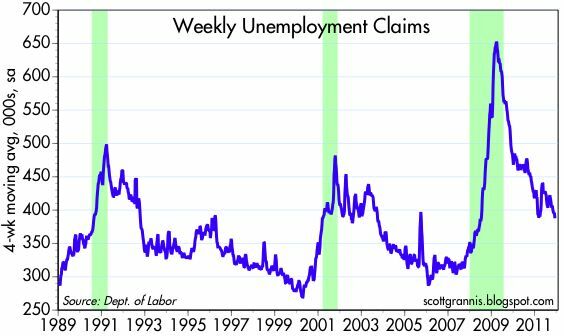 This is the best reading we've seen since the recovery got underway, and at the rate we're going we should see further declines in claims in the weeks ahead. Businesses have pared costs and employees to the bone, so they are likely to fire a lot fewer people than usual as the holiday season winds down. The ongoing decline in claims is an excellent indicator that the outlook for the U.S. economy is improving, so we should also see the equity market forge ahead to higher levels, as this chart suggests. 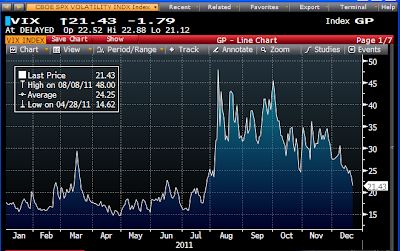 The ongoing decline in implied equity volatility (the Vix index) also argues for higher equity prices. With the news showing that the U.S. economy is not only not deteriorating but actually improving, despite the anguish in the Eurozone regarding PIIGS defaults, this removes an important source of uncertainty, and less uncertainty is almost always good for equity markets. 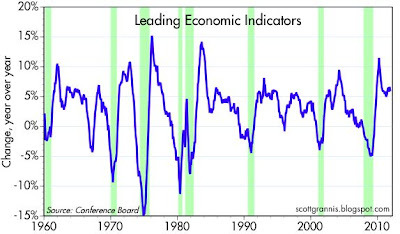 I'm usually reluctant to place much stock in the Conference Board's Leading Indicators, but they do not even remotely suggest that the U.S. economy is in trouble. Fourth quarter real GDP growth is now looking to be in the 3-4% range. 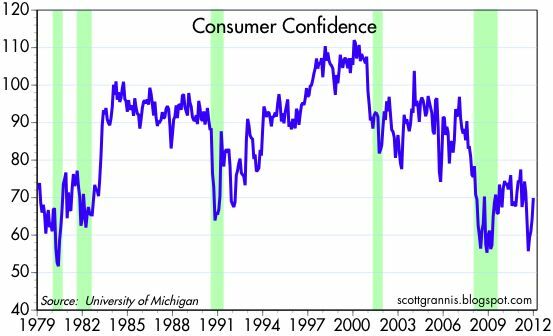 Consumer confidence usually lags reality, so the somewhat stronger-than-expected increase in the December Michigan Consumer Confidence survey reported this morning is simply confirmation that things haven't turned out as bad as most people were expecting. Confidence has picked up of late, but it is still at extremely low levels from an historical perspective. That's the recurring theme we've been seeing since last summer: markets and consumers were braced for a serious deterioration in the economic outlook, yet the economy has actually managed to improve somewhat. But the market is still climbing walls of worry, since on balance the market is not yet even slightly optimistic about the future. After all, we have yet to see the fallout of the Greek default which will almost certainly happen soon. This chart of the implied volatility of equity index options is sending a powerful message: the market's level of fear and uncertainty has declined significantly in recent weeks and months. We can only guess at the reasons for this, but the improved outlook is not just a function of today's massive ECB refinancing operation or yesterday's strong housing starts. I would argue that there is a whole host of developments that have brought more clarity and calm to the markets. Economic data have so far failed to reveal any economic collapse, despite the continued high level of stress in Eurozone financial markets (2-yr swap spreads are still in nosebleed territory at 115 bps). Markets have had 20 months to prepare for a Eurozone default, panicky investors have had plenty of time to take refuge, over-extended banks have had plenty of time to hedge themselves, and risk-loving hedge funds and distressed debt investors have had plenty of time to marshall their forces in eager anticipation of panic-driven sales. The U.S. economy shows every sign of continuing to grow, albeit at a disappointingly slow rate. Corporate profits continue to be very strong. Central banks have embraced their role as lenders of last resort, and liquidity in most parts of the world remains abundant. Profligate government spending is meeting strong resistance almost everywhere. If there is a single message here, it is that we are not on the cusp of the-end-of-the-world-as-we-know-it. Given how fearful the market has been, that's very good news. There were large revisions to the past few years' data on existing home sales, but the net result was a substantial reduction in the inventory of homes for sale. (See today's excellent posts on Calculated Risk for a detailed discussion of this.) The current inventory is now back down to levels last seen in 2005, and that brightens the outlook for the housing sector. Even the shadow inventory of homes (those with serious delinquencies and very likely to be foreclosed and sold) has declined, though it remains substantial. 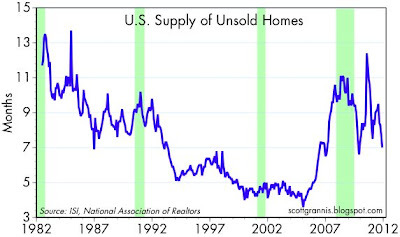 And even though the current sales rate is still far below what we saw in the heydays of the housing boom, the month's supply of inventory (second chart above) is now substantially lower than the levels that prevailed throughout the 1980s, and that, in turn, diminishes the threat of the shadow inventory. In sum, the housing market has undergone a gigantic and very painful adjustment, but the market is clearing, and the overhang of unsold homes now is on a par with what we have seen before and survived. 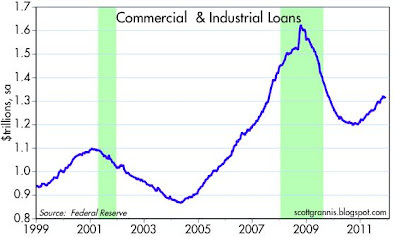 Moreover, financing costs are at record-low levels, and the economy continues to grow and incomes continue to rise. Therefore I don't think it is likely that the existing and shadow inventory of homes for sale implies a further wrenching adjustment. 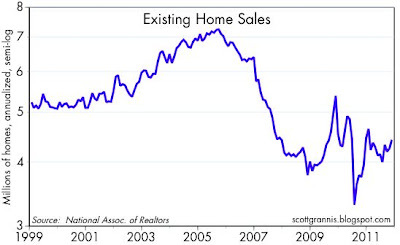 I continue to believe that we have seen the worst for the housing market. 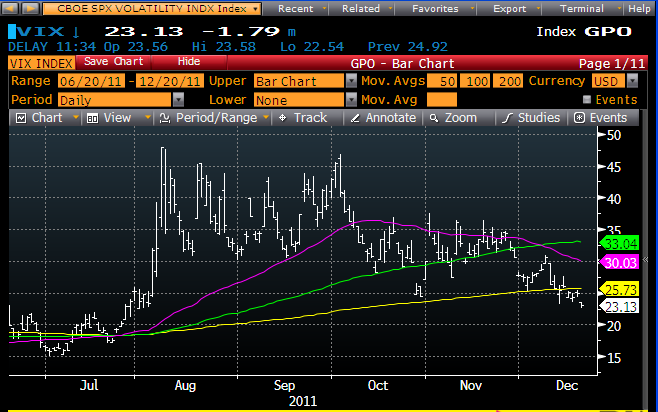 As this chart shows, the Vix index has dropped to a new post-Greece-is-likely-to-default, and the-end-of-the-world-as-we-know-it-is-nigh low. 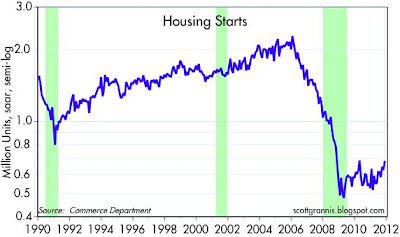 Ostensibly, today's good news on housing starts is the trigger for the S&P 500's 3% advance. But the good news has been accumulating for awhile now (e.g., jobs growth, car sales, exports, inventories, bank lending, retail sales, capex, corporate profits), even as the stress in the Eurozone financial system approaches the extremes of late 2008. Call it panic exhaustion: it's tough to continue to worry about the end of the world being right around the corner when the fundamentals continue to show improvement. And it's tough to worry that a Eurozone default will be a surprise or catch anyone off guard now that the world has had 20 months to prepare for it and markets have already marked down $1 trillion worth of sovereign debt. It's tough even to worry that a major sovereign default will bring down the global economy, since defaults are a zero-sum game that don't destroy demand. The bad thing about defaults is what led up to the defaults: all that deficit-financed spending that was squandered on transfer payments and faux-stimulus policies. What's pushing the market up is the growing realization that despite all the concerns out there, the global economy is not hanging by a thread. On the margin, fears are declining. In part, that's because billions of people continue to go to work every day, and corporations continue to rake in record profits. It's also the case that, despite their best efforts to muck things up with "stimulus" policies that only work to restrain growth and increase uncertainty, governments and central banks are rapidly approaching the point where they can do no more harm. 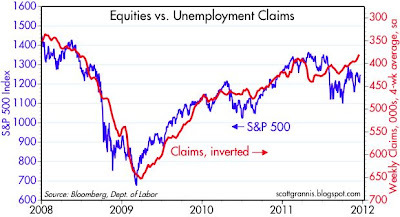 Keynesian stimulus policies have been almost completely discredited. Monetary policies have reached the "zero bound." Quantitative easing has been so massive already that adding a few more hundreds of billions to bank reserves can't possibly make any difference, except to further weaken currencies and boost destructive speculation. Meanwhile, the fundamentals that lead to real growth—the private sector's dynamism and willingness to work and invest—have been slowly and quietly improving behind the scenes, despite all the headwinds and roadblocks that governments have thrown in their way. Argentina's central bank has been hemorrhaging reserves this year in its attempt to keep the paso from falling more rapidly against the dollar. Money is fleeing Argentina—possibly as much as $20 billion dollars so far this year—because people don't trust the government and don't trust the currency. The peso is becoming overvalued, the government is understating inflation, and the government is trying accomplish by force that which can only be achieved by trust. The government is actively trying to prevent people from taking money out of the country. In the latest move, sniffer dogs are being deployed at border crossings to detect bundles of dollar bills. The more the government tries to stem capital flight, the more there will be. Capital only stays in places where it is welcome and free to leave. Argentina instead punishes capital with steeply progressive tax rates, by hiking export taxes and limiting access to cheap and essential imports, and now by limiting how much Argentines can spend when they want to travel abroad. It is almost impossible for a government to prevent capital flight by force; there is no shortage of ways that fearful citizens and corporations can manage to circumvent capital controls—and the more a government tries to stop it, the more fearful and resourceful people become. We've seen this movie many times in the past, and it always ends with a tragedy. If there is one thing certain about Argentina's future, it is that there will be yet another major devaluation and the inevitable recession that follows. The only question is when. At this rate the timetable is accelerating. Very sad. November housing starts beat expectations by almost 8% (685K vs. 635K). Not only that, but they are up 30% so far this year, and up 43% from their all-time low, April 2009. 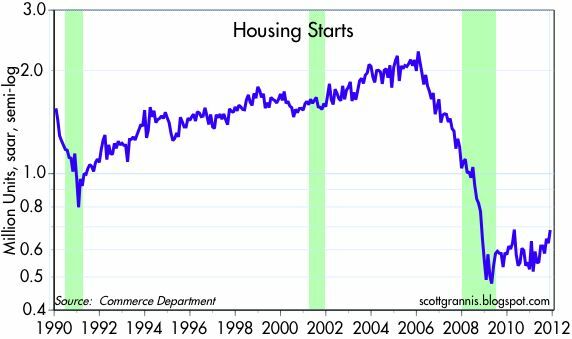 They say that housing cycles typically last 5 years, but this one has been the worst ever and has lasted almost 6 years. 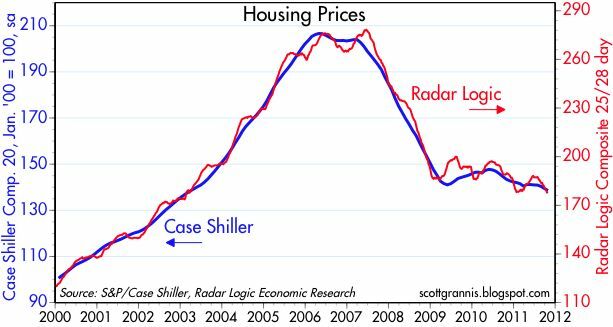 Thus, there is every reason to believe that we have indeed seen the bottom in housing and that a recovery is now underway. They also say that an upturn in residential construction is an essential part of a larger economic recovery; if so, then maybe the recovery skeptics will finally have to change their tune. Unvarnished good news, and the harbinger of much more good news to come. The collapse in housing starts has allowed a huge reduction in the excess inventory of homes, bringing supply back in line with demand. As the economy slowly improves, new family formations advance, and more people working want new and better homes, the nation could find itself with a shortage of housing before too long and much higher prices and interest rates to boot. This is a recovery that can feed on itself, and its still in its infancy. 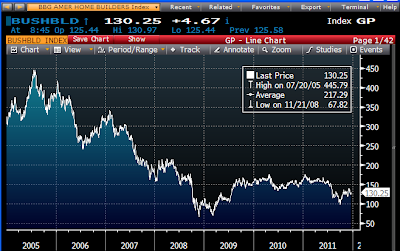 This index of homebuilders' stocks has almost doubled from its late-2008 lows, and has the potential to double and even triple from here if housing starts regain their former altitude. Commercial & Industrial Loans (a good proxy for bank lending to small and medium-sized businesses) are up 9.6% in the past year, or $116 billion. As this chart shows, remodeling activity has surged this year (source). I should know, since we have done quite a bit of it ourselves this year and last. Plus, some contractor friends—particularly one that specializes in energy retrofitting—tell me that business is doing very well. As Calculated Risk notes: "The BuildFax Residential Remodeling Index increased for the twenty-fourth straight month in October to 147.6, a new high for the index. 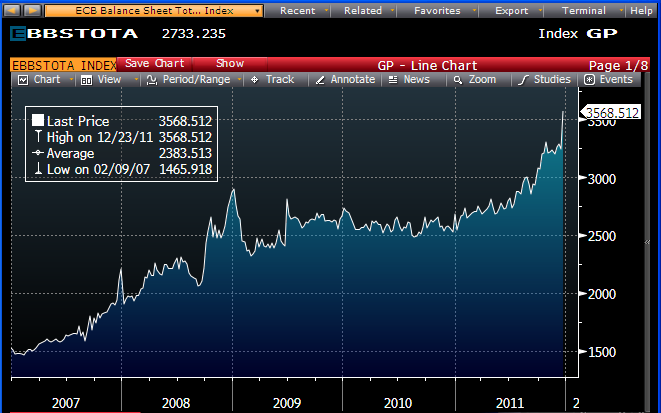 This was up from 141.4 in September, and up 39% year-over-year from 105.8 in October 2010. This is based on the number of properties pulling residential construction permits in a given month." Not everything is in the dumps, as you might expect if you only looked at the stock market, PE ratios, and 10-yr Treasury yields. The first chart shows the history of M2—arguably the best and broadest measure of "spendable" money—over the past 17 years. 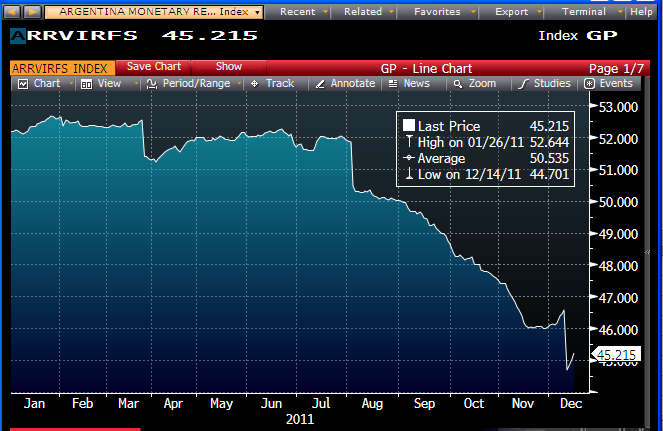 As should be obvious, there is no shortage of money; M2 has been growing by more than 6% a year for a very long time. The second chart narrows the focus to the past 5 years. 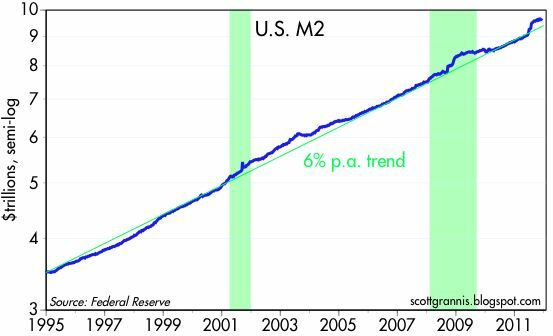 On this scale, two "bulges" in M2 growth stand out, and they correlate nicely with periods of financial panic which caused the public's desire to hold "money" to rise. The late 2008 bulge gradually disappeared as the recession ended and the confidence returned. The current bulge also looks to be gradually fading, which could be a welcome sign that fear of a Eurozone financial collapse is beginning to abate. 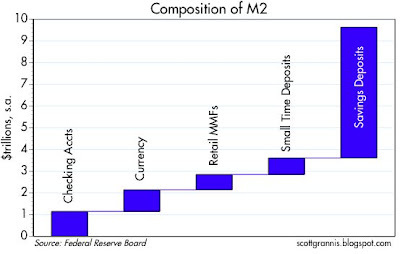 Almost all (80%) of the latest "bulge" in M2 has come in savings deposits at large commercial banks, and this category is by far the largest component of M2 (see above chart). The Fed cannot force-feed money into savings deposits; people park money in banks only because they want to hold it, and that is especially true now that the interest rate on savings deposits is virtually nil. 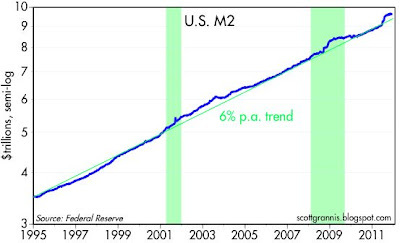 In other words, exceptional M2 growth in recent years has been almost exclusively a demand phenomenon, rather than a supply phenomenon: it's not that the Fed is running the printing presses in order to push prices up, it's that the demand for money has surged to unprecedented levels, and the Fed has been willing to accommodate this with generous supplies of bank reserves. Exceptional M2 growth has not sparked a big rise in inflation, because it has been the result of increased money demand. This may well change in the future, of course. If the demand for money begins to decline and the Fed does not act in a timely fashion to withdraw bank reserves from the system, then we could have an inflationary problem. This is one of the fears the weighs heavily on markets, and is likely one of the reasons that the price of gold has doubled since 2008. 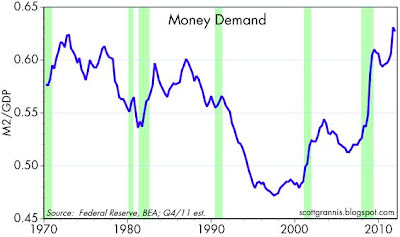 This chart tracks money demand (the ratio of M2 to GDP). Since the onset of the 2008 recession and subsequent financial panic, the public's demand for money balances has soared in unprecedented fashion, and to an all-time high. The M2/GDP ratio has increased almost 20% since the end of 2007; i.e., money growth has exceeded nominal GDP growth by 20% in the past four years. If the increased demand for M2 in recent years were to reverse without there being an offsetting decline in the amount of M2, this could eventually fuel an extra 20% increase in nominal GDP, and much of that could come in the form of higher inflation. 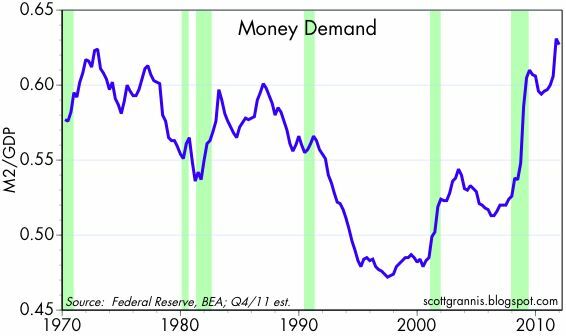 In fact, money demand has most likely already fallen from its peak, because annualized M2 growth in the most recent 3-mo. period has been only 2.6%, while nominal Q4/11 GDP growth is likely to be at least 5% (e.g., real growth of 3-4% and inflation of 1-2%). 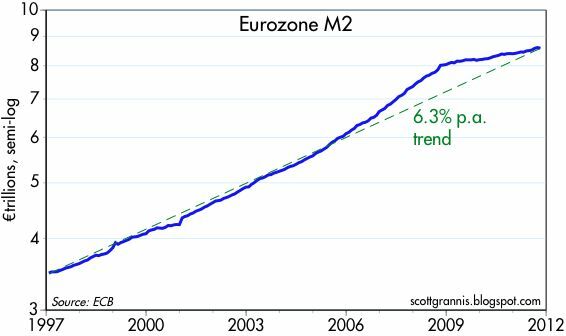 If the Eurozone crisis manages to morph into a non-catastrophic problem, then confidence will slowly return, money will come out of hiding and be spent (e.g., be withdrawn from savings deposits), and economic activity will almost certainly pick up. We could be in the very early stages of this process already. The November CPI report was uneventful, but if anything it's a nice Christmas present because it shows that inflation is not the problem that so many—including me—have worried about, at least for now. Most measures of inflation in fact have been relatively tame in recent months, showing inflation to be running at about a 2% annual rate, which is nothing at all to be concerned about. The first chart above shows the year over year change in inflation, while the second shows the 6-mo. annualized rate of inflation. Using more recent data, this second chart highlights the relatively tame nature of current inflation. Falling energy prices have been a big part of the reason inflation has been so tame. This chart shows the CPI ex-energy, but even that is only running at 2.4% over the past six months. 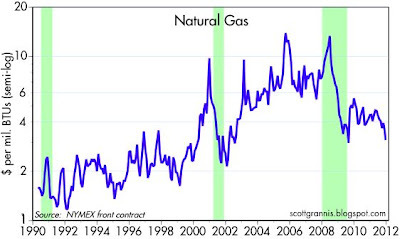 Natural gas prices have fallen significantly, thanks to huge new discoveries and production in the U.S. As Mark Perry notes, in looking at the CPI report, natural gas is "the only item that has fallen in price over the last 12 months (-1.3% vs. a 19.7% increase in gasoline)." If anything is disruptive, this is, because (as the second chart above shows) natural gas has now become incredibly cheap relative to oil. This is going to transform energy-intensive industries and enrich the lives of everyone. I'm not letting down my inflation guard, however, but for the time being my level of concern has eased, and that adds to my belief that the outlook for the economy is better than most people think. 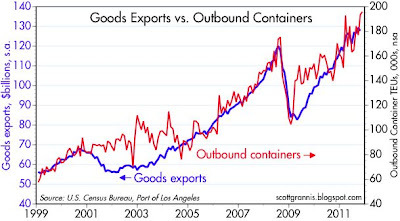 I first noted that outbound container traffic was a good leading indicator of goods exports in an April 2009 post. 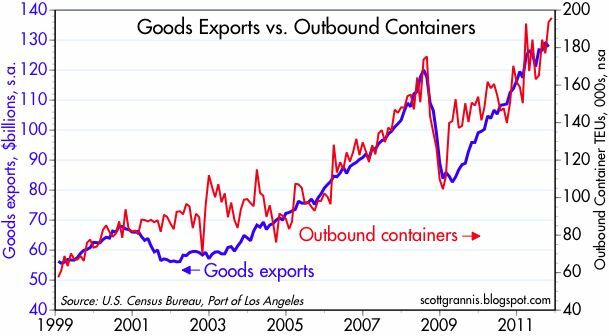 Container traffic data comes out in a much timelier fashion than goods exports, and it turned up months before we learned that exports had indeed started to recover; that proved to be an excellent end-of-recession indicator. With today's release of November container traffic data from the Port of Los Angeles—up 15% from a year ago—it looks like goods exports are still enjoying robust growth. That's excellent news for the U.S. economy, and it also suggests that the economies of our trading partners are improving as well. The November PPI was in line with expectations, and didn't show anything unusual. 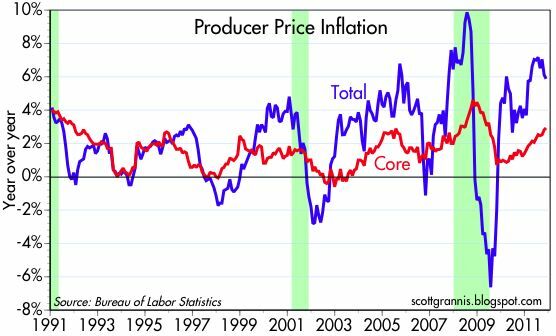 As the chart above shows, the pace of headline PPI inflation has moderated a bit—it's up at only a 3% annualized pace over the past three months—but core PPI inflation has picked up a bit. With this chart of the actual producer price index, I'm trying to show the bigger picture. The y-axis is plotted on a logarithmic scale so that rates of growth become easier to appreciate. 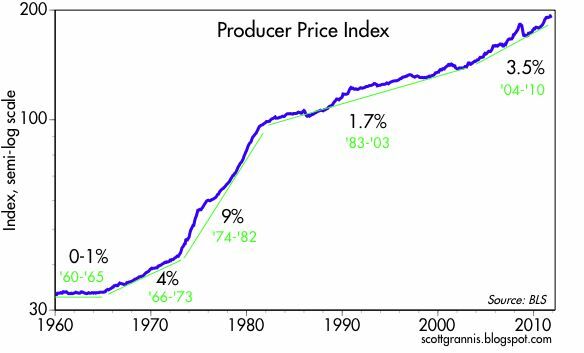 Note the huge 9% annualized growth in the 1970s, followed by the 1.7% annualized growth in the 1980s and 1990s; that's a dramatic statement about just how inflationary monetary policy was in the 1970s and how well Volcker and Greenspan were able to arrest that inflation. In the past 8 years, however, the pace has picked up again, with inflation posting a 3.7% annualized growth rate, double the rate of the preceding two decades. 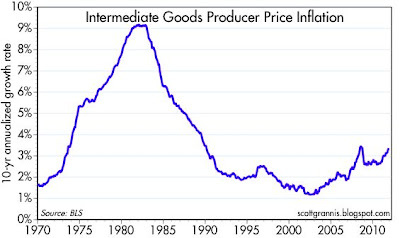 Inflation is far from being a menace, but it has definitely picked up. The Bernanke Fed can not claim to have done a very good job delivering price stability. 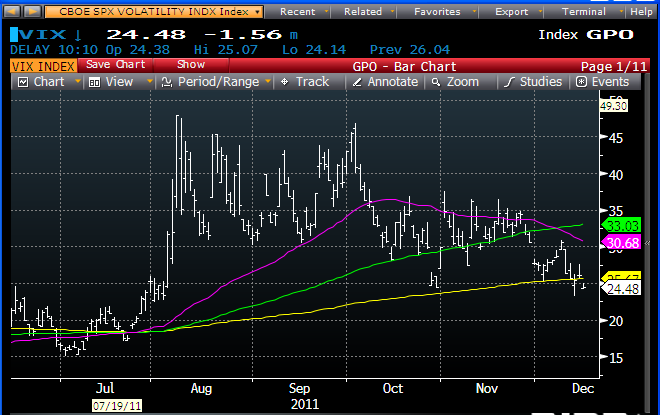 The chart above shows the same pattern, only it focuses on intermediate goods, and uses a 10-yr rolling annualized return. 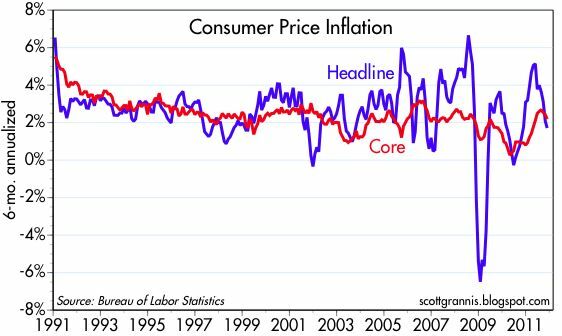 Inflation has clearly picked up in the past 8 years, and I note that this same measure is up 15% over the past year. 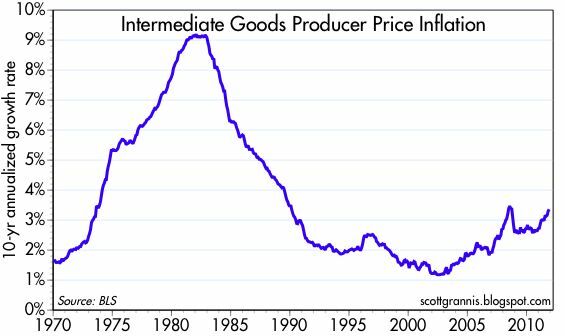 Moving further up the production pipeline, the PPI crude materials measure of inflation has risen at a breathtaking 9.6% annualized pace over the past 10 years, which translates into a 150% increase in prices. From this I conclude that it's premature to view the moderation of the overall PPI in recent months as a precursor to a more moderate inflation regime. Sometimes it is difficult to see signs of improvement in the aggregate data until a trend is clearly underway. Changes on the margin can be hard to detect, and nothing is for sure until things are clear, but of course by then it may be too late to get on board. Here are some charts of relatively obscure developments that are looking very good on the margin. 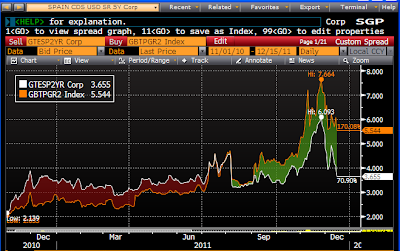 This chart compares the yield on 2-yr Spanish (white line) and Italian (orange line) bonds. The outlook for Spain has improved dramatically in the past three weeks, with yields plunging from 6.1% to 3.7%, thanks to what looks like an emerging political consensus that supports austerity measures. Things have even improved for Italy, with yields falling from 7.7% to 5.5%. Italy may not have the austerity consensus that Spain does, but Italy's deficit is less than 5% of GDP, so the fundamentals have never been even close to awful. As a caveat to this otherwise good news, I note that 2-yr Eurozone swap spreads are still hovering around 110 bps, and that is very high. There has been some piecemeal improvement in the Eurozone, but not enough to make a significant difference to the overall level of systemic risk facing the banking industry. But a few more bits of good news like this could mark a tipping point of sorts. 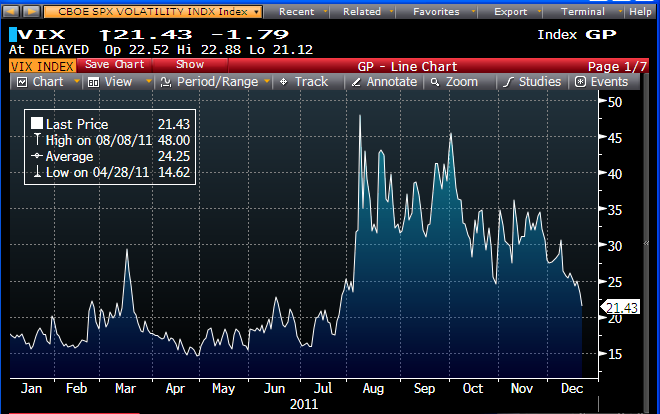 The Vix index today fell to its lowest level since the August eruption of bad news from the Eurozone. I've called this "panic exhaustion," but it could also be the result of the simple passage of time, since that gives markets an opportunity to brace for bad news. 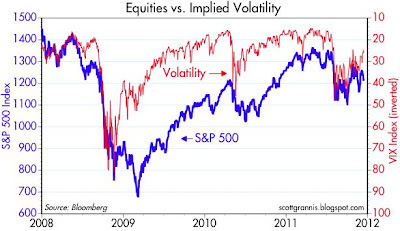 Markets do not stand idle when challenges and risk present themselves. Given time, those with too much risk exposure can lighten up, while others with more risk appetite can marshall their resources, and that in turn improves the market's fundamentals. 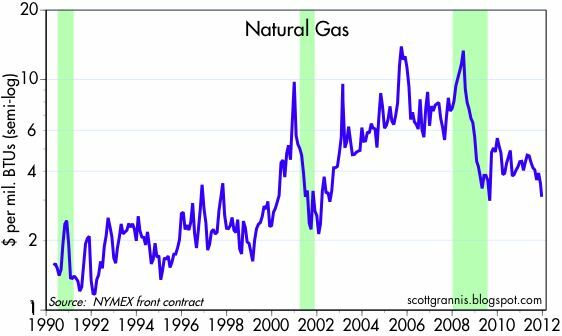 I see this decline in underlying risk as a very healthy development, a precursor of real fundamental changes in the outlook. 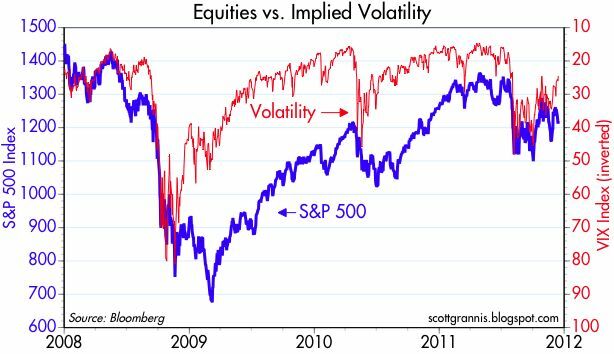 As the chart above shows, a decline in the Vix suggests that we could see some improvement in equity prices going forward. The ongoing decline in weekly claims for unemployment is also pointing to higher equity prices. An improving U.S. economy goes a long way to negating the Eurozone headwinds. 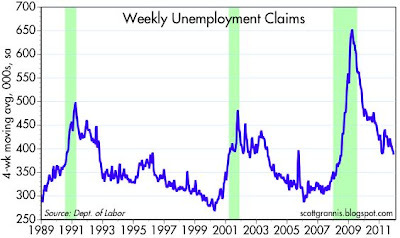 The news from the weekly unemployment claims front just keeps getting better, as claims for the recent week came in substantially below expectations (366K vs 390K). Claims are very timely data, and they paint a picture of a jobs market that has been improving almost continuously for the past two years. 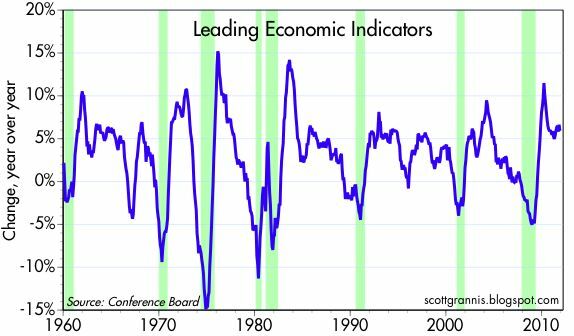 There is absolutely no sign here of the double-dip recession that ECRI insists is imminent, because a sustained rise in seasonally adjusted claims has marked the beginning of every recession in the past 40 years. On a seasonally adjusted basis, declining claims at this time of the year means that layoffs are not rising as much as they have in prior years. Layoffs typically rise beginning in October and reaching a peak in early January. This year they have also risen, but by much less than they would have in a typical year. This means that businesses have really gotten lean and mean—minimizing seasonal hiring and relying more on working existing employees harder, and that is one reason corporate profits continue to impress. This also means that as the economy continues to pick up, it becomes more likely that the pace of hiring will not only continue at its recent 1.5% annual pace, but increase and gradually bring down the unemployment rate. Nothing is likely to happen fast, however, so I doubt there will be substantial improvement before next year's elections, which means that a sluggish and disappointing recovery is almost certainly going to be one of the election's major themes. The bond market is out of whack, because bond yields are not consistent with the inflation expectations embedded in bond prices. The top chart compares yields on 10-yr Treasuries to the year over year changes in the Core CPI. Normally, the two should move at least in the same direction, and at approximately the same level, since over time the rate of inflation is the major determinant of bond yields. Instead, they have moved sharply in opposite directions over the past 6 months or so. Ok, you say, but maybe the decline in bond yields is simply the market saying that inflation will be much lower in the years to come? If that were the case, then the second chart would look very different. As it is, it plots the market's 5-yr, 5-yr forward expected annual rate of inflation, based on the relative prices of 5- and 10-yr TIPS and Treasuries. This is the sensitive, forward-looking measure of inflation expectations that the Fed considers to be the most important and most reliable. 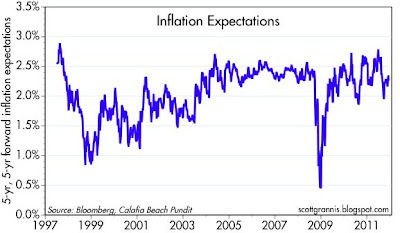 Inflation expectations by this measure are about where they've been for the past 10 years (between 2 and 2.5%), so there's nothing unusual here. 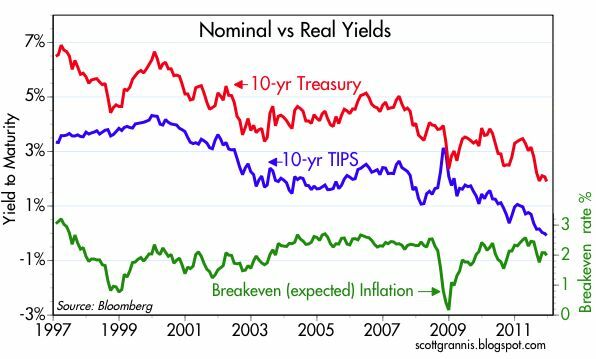 And if you consider the third chart, which compares 10-yr Treasuries to 10-yr TIPS, the message is the same: inflation expectations are nothing out of the ordinary, and very much in line with what we have seen over the past decade. 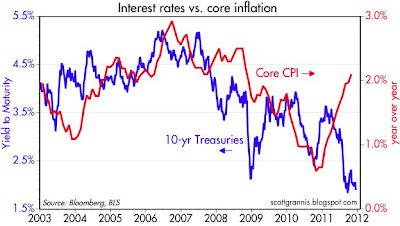 So the problem is that the current level of 10-yr bond yields is priced as if inflation were headed to zero, when a broader look at the TIPS and Treasury market reveals that inflation expectations are somewhere in the neighborhood of 2-2.5%. The only reasonable explanation for this divergence, as far as I can tell, is that the level of Treasury yields is artificially depressed. 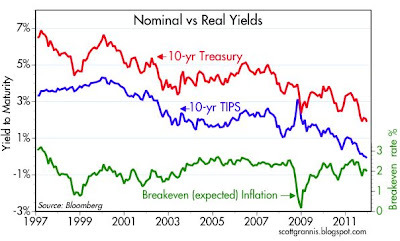 TIPS and Treasuries of similar maturities, when taken together, are priced to normal inflation expectations, but in isolation their yields are too low to be consistent with their implied inflation expectations. This is a highly unusual circumstance that can only have highly unusual roots. I think those roots are most likely to be found in the Eurozone. 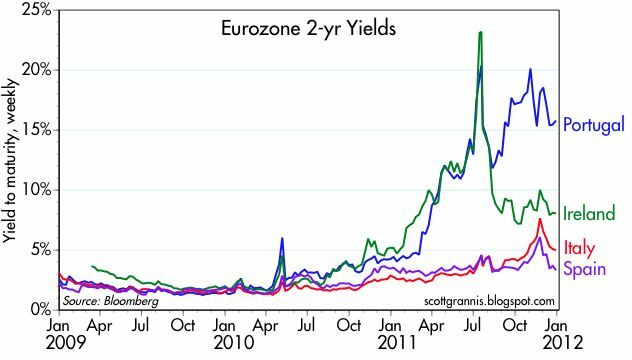 Such is the fear that the PIIGS defaults will destroy the Eurozone banking system and ultimately lead to a global depression and a financial market collapse, that investors are willing to pay exorbitant prices for Treasuries in view of their safe-haven status. 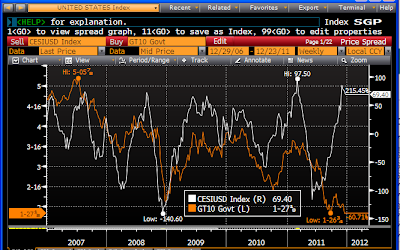 The risk-free status of Treasuries seems paramount, far more important than possible concerns about inflation. If there is a message here for investors, it's that fear has reached extraordinary levels, artificially inflating the prices of Treasuries. And it's not a stretch to go from that conclusion to the belief that fear is also artificially depressing the prices of equities. 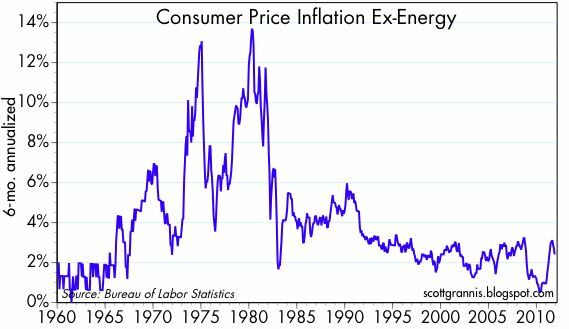 Current prices can hold only if we really are on the cusp of a major collapse. To be bearish you have to believe that the collapse will be unlike anything we have ever seen before, or maybe even worse. Gold is down 18% from its summer highs. The euro has dropped 12% against the dollar since April, while the yen has risen almost 10%. These all sound like big numbers for such a small time span, but the chart above shows that they are mere ripples in a very large pond. The big story here is that all currencies have depreciated massively in terms of gold over the past decade. Some (like the yen) by less, some (like the dollar and the euro), by much more. In yen, gold is worth less today than it was at its early 1980 peak (one third less, to be exact); in dollars, gold is worth 90% more. The relative worth of currencies tells us a lot about the underlying inflation fundamentals of each. As this chart shows, the dollar has fallen massively relative to the yen since 1978, with the yen soaring from 240/dollar to 78. 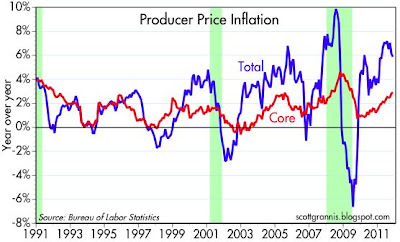 This fact alone dictates that the dollar has suffered from much more inflation than Japan. 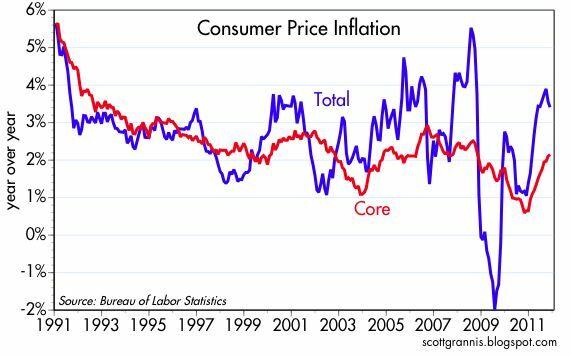 So its not surprising that since 1978, U.S. consumer prices have risen 264%, while Japanese consumer prices have risen only 50%. Since the dollar has fallen 30% against the DM over that same period, it makes sense that German consumer prices have risen by 40% less than U.S. consumer prices (115% vs. 264%). Gold is a good reference point to compare the relative behaviors of currencies (A Gold Polaris, as the late Jude Wanniski put it), and arguably, it also tells us about the market's future expectations for how currencies and their purchasing power are likely to behave. Since gold has risen significantly against all currencies in the past several years, that tells us that the market is expecting inflation in all countries to rise in coming years. Since gold has risen the least in terms of yen, that implies that the market expects the yen to suffer from much less inflation than most other currencies. As I see it, the huge rise in gold in dollar terms in the past decade was the market's way of worrying that U.S. monetary policy was adrift, no longer tied to something like a Taylor Rule, and instead more focused on promoting growth and bailing out banks and debtors at the expense of sacrificing purchasing power. The dollar's rise against the euro since last April, while both have fallen relative to gold, is the market's way of saying that the Eurozone sovereign debt crisis is changing the outlook for ECB monetary policy: the ECB has become a less reliable advocate for low inflation and is now instead more likely to succumb to pleas to bail out the southern European nations by running the printing presses faster. Meanwhile, the dollar of late has benefited at the expense of the euro not only because the ECB seems to be losing its independence, but also because the U.S. economy is gradually decoupling from the problems of the Eurozone. U.S. growth has been gradually picking up (though still painfully slow), while the Eurozone economy has been slowing down; U.S. stocks have outperformed Eurozone stocks by 25% over the past year. But I hasten to add that the price of gold today is still pointing to the very real risk that the U.S. government will resort to the printing press to help address the looming problem of out-of-control spending and soaring debt burdens. 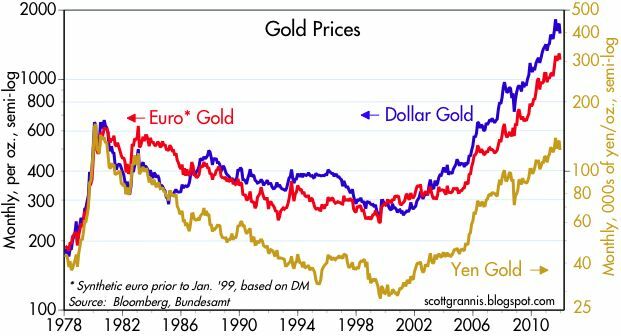 How to explain the fact that gold prices have fallen 13% in dollar terms, 16% in yen terms, and 11% in euro terms since gold hit its all-time highs last September? I'm going to guess that the across-the-board selloff in gold may be an indication that the market was priced to Armageddon last September—a global depression and massive monetary and fiscal policy uncertainty—and is now seeing that while things are still bad, the end-of-the-world-as-we-know-it is not inevitable (e.g., the U.S. economy is slowly improving, the political winds are moving in the direction of less profligacy, even in Europe). Others might say we are simply seeing the forced unwinding of massive and leveraged gold speculation, but I think there is a fundamental explanation in addition to a technical one. 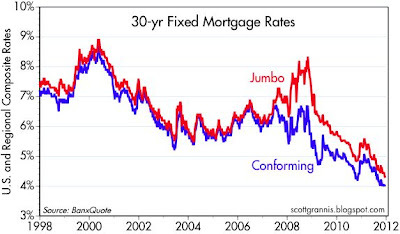 30-yr fixed rate mortgages have never been cheaper. The latest data show that the nationwide average for conforming, 30-yr fixed rate mortgages is 3.99%, and the rate for jumbo mortgages is 4.28%, both at new all-time lows. Plus, the spread between conforming and jumbo rates is now down to just 30 bps, which in turn is the average spread during times of relative market calm. It doesn't get much better than this for homebuyers. Anecdotally, I was talking with a prominent realtor friend the other day and remarking about how incredibly affordable housing has become. She agreed, but noted that the problem as she sees it is that most people are just plain terrified of buying a house these days. That's one very good reason why houses are so cheap. 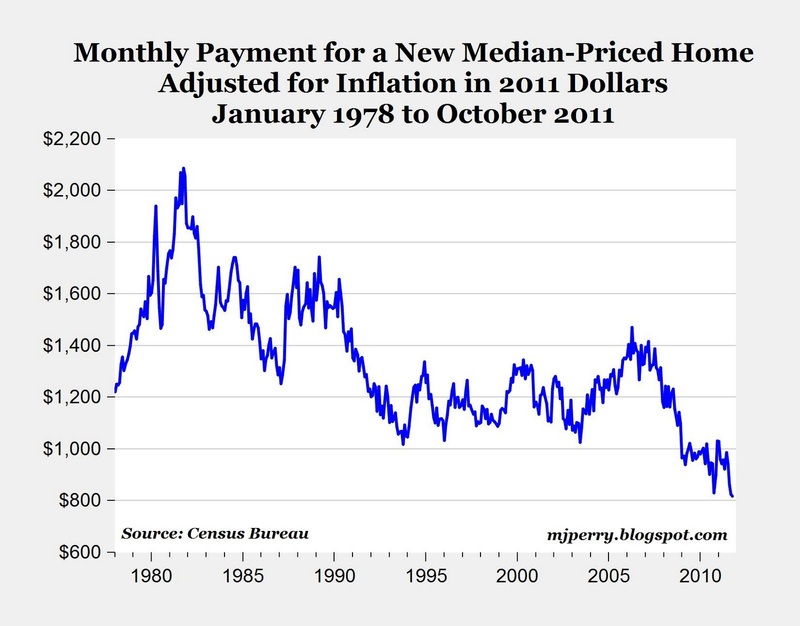 This chart comes from Mark Perry, and is the best one I've seen when it comes to housing affordability.